When it comes to affordable furniture offered in a wide variety of styles, Ikea takes the cake. In fact, when we asked a few of our favorite designers what their all-time, must-have Ikea product was, blogger Shavonda Gardner of SG Style Blog said, “Oh boy! That’s like asking me to choose a favorite child!” With its plentiful offerings of affordable furniture, on-trend collaborations, and of course, endless ways to hack accessible furniture and make it more personalized, Ikea is pretty much everyone’s go-to for home goods. Not to mention the fact that its flat-pack products can be shipped conveniently to your door. Whether you choose to wander their extensive selection online or do it in-store, the Swedish retail giant isn’t just a go-to destination for those looking to furnish their first apartment, but a tried-and-true cost-cutter for design pros looking to bring affordable and style-focused flair to their homes. In the past, Ikea may have gotten a bit of bad rep for difficult assembly, but nowadays there are companies that will assemble it for you. So along with being incredibly affordable, it’s also incredibly easy to get the look you want, and that is a design philosophy (and lifestyle) we can definitely get behind on. From newer lines to classic, timeless pieces, it seems like everyone has at least one Ikea item in their home—and the pros are no exception. So we turned to a handful of our trusty designers to get the lowdown on the Ikea finds they simply can’t live without. From bookcases to bed frames and everything in between, these designers prove that Ikea truly does have it all. Read on for their takes on the essentials and the clever ways these designers are bringing the pieces home. Natural materials and Scandinavian craftsmanship make this nightstand a favorite for interior designer Amber Lewis. Lewis is a fan of the entire Bjorksnas collection for its simple finishes that can match any decor scheme and we couldn’t agree more. The easy craftsman composition and unfinished wood detailing of this simple piece are minimal yet trendy, and the leather drawer pulls add on a stylishly functional element. Designer Claire Zinnecker is also a fan of rattan—this textured coffee table brings on all the laidback vibes and effortlessly chic style. As a streamlined accent to your living room, this special collection item may not be around forever, so don’t wait too long on it! The pax closet system”] is as useful as it is timeless, with accessories that can be added on to help you organize and essentially turn it into your own custom storage piece. This wardrobe system isn’t just great for the bedroom either—use it in the living or playroom to keep toys or electronics out of sight. Shavonda Gardner of SG Style Blog puts this one at the top of her list of Ikea favorites. Lewis is also a fan of this 5-drawer chest, which matches the minimalist nightstand. With ample storage and style, it feels classic and understated enough to match the decorative aesthetic of just about any bedroom. Speaking of versatile side tables, nothing tops the lack. “Ikea’s mix-and-match table bar has turned out some amazing hacks,” says artist and desert-dweller Lindsay Hollinger on one of her favorite pieces. “Designers make some really chic workspaces using the various tops and legs. A little paint and styling and it looks really modern,” she says. Plus, it comes in a few different colors for endless variation and is under $10, which is unbeatable, even by Ikea’s standards. Joy Cho and Katrina Blair Sullivan rave about this useful essential that comes in a variety of finishes and can be customized to work in just about any room. You can choose a ready-made combo or adapt these shelves to your own style and needs, making them a must-have for virtually any space. The best part? These shelves provide ample storage for those with limited floor space. Jacquelyn Clark of Lark & Linen Design loves this six-drawer dresser but revamps it to give it a fresh upgrade by changing out the hardware. With so many ways to hack an Ikea dresser, we love how simple and easy this idea is. Plus, the wide chest of drawers gives you plenty of storage space as well as room for lamps or other items you want to display on top for a bit of personalized flair. Robin Wilson is a big fan of Ikea’s mini plastic tables and chairs for the little ones. You can’t beat the low price, plus they’re durable and easy to clean. You can even put these outside with no worries of damage. Natalie Myers of Veneer Designers also loves the selection of kids’ furniture and decor ikea has to offer. “They offer a lot of natural style inexpensively for furniture pieces you know your kids will outgrow and/or destroy along the way.” She names the Kura bunk bed as one of her favorites: “It gives the bunk bed experience without the scary height.” Myers used it in both of her children’s rooms without the white melamine panels for a minimalist take that better matched her decor. Have kids with a crafty side? Consider this sweet little table, which Myers says her daughter will spend hours at, just creating. It’s the perfect size and scale for little ones and comes in at the perfect price point for adults. Add Ikea’s TROFAST storage boxes under the top of the table to keep toys and supplies in one tidy place. Another one of Gardner’s favorite pieces, the billy bookcase is basically the most versatile item of furniture one can own, and a favorite of several designers and design fanatics. Plus, you can hack this iconic piece to serve as a storage closet, entertainment center, and so much more. Use it as is or add a little bit of paint and a few accents to transform this storage staple into its own statement piece. You can never have enough basic white dishes and serving platters, and according to designer Heather Bullard, Ikea is the place to stock up. 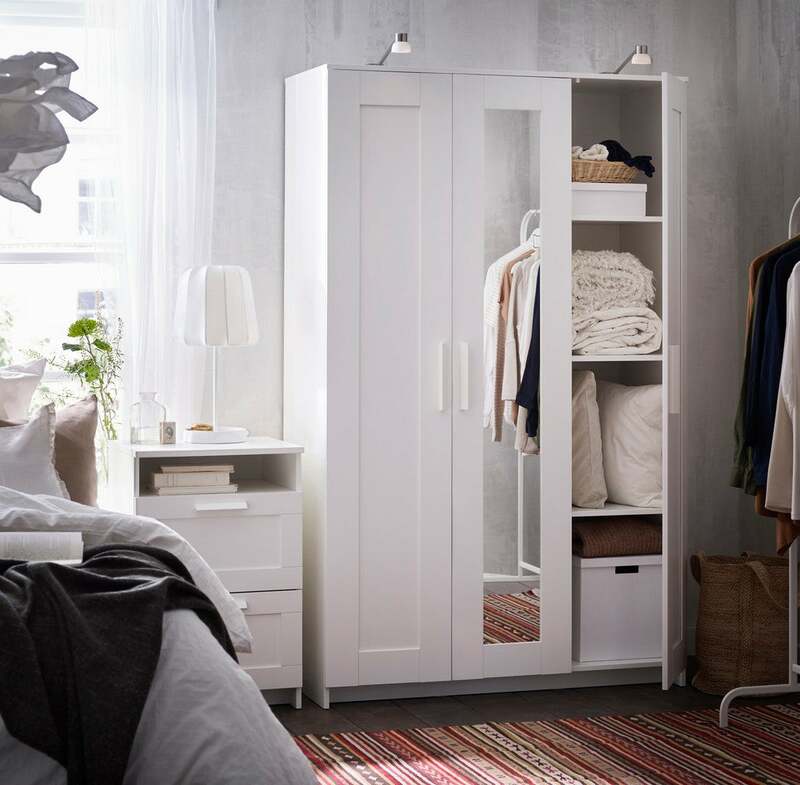 With affordable options from the Ikea 365+ line, you can grab all of those necessary essentials in one convenient place. They’re just as perfect for everyday use as they are for entertaining. Another favorite of designer Natalie Myers, this modern staple works in just about any setting. Though the black and white pattern may seem bold at first, it makes a decidedly chic statement thanks to the shaded stripes. Perfect for under your dining room table or coffee table, we love the way this stylish rug complements any palette or aesthetic, adding a pop of pattern without seeming overwhelming. Even though we automatically think of furniture when we think of Ikea, don’t forget about their wonderful faux plant selection. Sarah of Room for Tuesday advises that when it comes to areas where it’s better to save versus splurge, you’ll want to opt for affordable Ikea plants or pots. She promises that their wide selection will look just as good as the real thing! Meanwhile, Whitney Leigh Morris of Tiny Canal Cottage used a variety of affordable outdoor planters to revamp her outdoor seating area on a budget.